Saitama is the main protagonist of OnePunch-Man, and the most powerful hero alive. Having apparently trained himself to superhuman condition, Saitama faces an existential crisis as he is now too powerful to gain any thrill from his heroic deeds. He is registered with the Heroes Association as a C-Class Superhero and is tasked to defend Z-City against Mysterious Beings. 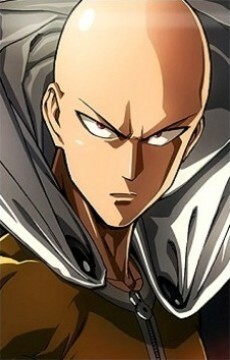 Appearance: Saitama is a bald man of thin, but well-built physique and average height and weight. He claims to have lost all of his hair suddenly and prematurely as a result of the toll taken on his body by intense hero training. Three years before the story line, Saitama had spiky, black hair and brown eyes. Saitama is usually deliberately drawn in a simpler style than other characters, with a very rounded head and only a simple mouth and eyes. When drawn in a more 'action-oriented' style with more detail, Saitama is revealed to have sharp features, dangerous looking eyes, and chiseled musculature. His costume is a plain yellow jumpsuit with a short zipper at the collar and a belt. The costume is finished out by a red ensemble of boots, gloves and a cape. Personality: For a superhero, Saitama is rather laid-back. Because even the mightiest foes pose no challenge to him, he doesn't take his hero work very seriously. In spite of this, he is constantly searching for an opponent that can challenge him, since his superhero work is beginning to bore him because it's too easy. The combination of his attitude, unstoppable strength, and distinctively simple and 'unimpressive' appearance often cause his battles to become anticlimactic. Saitama will usually allow his opponents to rant about their motives and power up into their strongest forms before suddenly and nonchalantly obliterating them with one punch.